Media censors left wing violence. Above picture. 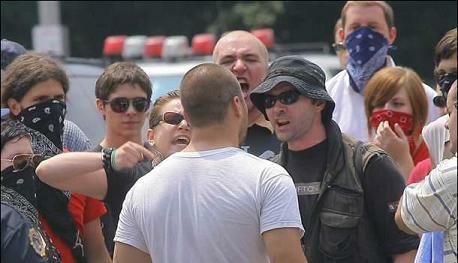 Members of Marxist youth gangs, many wearing masks, scream profanities at a man who attended a Morristown, NJ rally for securing the border. Wearing a mask in public is both cowardly and a violation of New Jersey state law. Imagine for a moment that a mob of conservative activists pulled a left wing couple out of their car and beat them in street. Imagine they hit a woman on the pipe with a metal pipe that required 15 stitches. Imagine that the victims were left wing activists. This would have been a national news story within a half hour. But the wave of left wing violence in Morristown, NJ has been completely ignored by the press. One small newspaper reported the violence and even they downplayed it. For more information, read the stories on Morristown, NJ below. This entry was posted on Monday, July 30th, 2007 at 4:43 pm and is filed under Uncategorized. You can follow any responses to this entry through the RSS 2.0 feed. Responses are currently closed, but you can trackback from your own site.